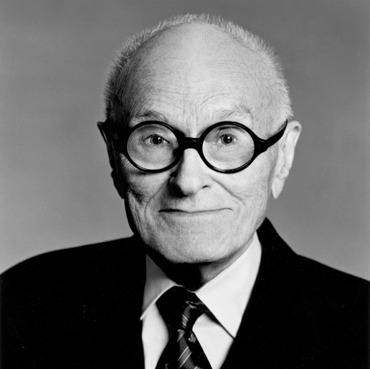 By any measure, Philip Johnson was a giant in 20th- century world architecture. For more than seven decades, he helped define the movements of his time, from Modernism to Postmodernism and back again. He occasionally signed his work with a provocative detail, like the Chippendale-style pediment atop Manhattan’s pink granite AT&T (now SONY) Building (1984). When a Philip Johnson project was completed, it raised both eyebrows and more commissions. Johnson, a Cleveland native, gravitated to the arts from his undergraduate days at Harvard, where he majored in history and philosophy. A son of privilege, he enriched his formal studies with European travel. A visit to the Cathedral at Chartres at age 13 awakened his artistic sensibilities. Years later, when he discovered the Parthenon and Bauhaus, he began what would become a lifelong affair with design. Johnson was only 26 when he helped change the face of architecture in America. Working as founding director of the Architectural Department at New York’s Museum of Modern Art, he co-developed a groundbreaking 1932 exhibit entitled The International Style: Architecture Since 1922. Now, he could introduce the work of Le Corbusier, Walter Gropius and Mies van der Rohe, avant-garde architects who had already left their mark on Europe. That same year, he co-authored with Henry Russell Hitchcock The International Style, a state-of-the-art catalogue that became an instant classic. Although Johnson had established his credentials as theorist and taste-setter in his 20s, he waited until age 34 to enter graduate school in architecture. There, too, he broke the mold, having authored one of the textbooks (The International Style) and actually building the home he designed for his master’s thesis. His 1972 Cleveland Arts Prize arrived at what would later be seen as the midpoint in his career. It acknowledged, among other achievements, New York’s distinctive bronze Seagram Building (1958, built with Mies Van De Rohe); the 1953 Rockefeller Sculpture Garden at MoMA; and the New York State Theater at Lincoln Center (1964). The award also recognized Johnson’s signature “Glass House” (1949), which he built for his own use in New Canaan, Connecticut. Most agree this was his crowning achievement, a rectangle of steel-supported glass (56’ x 32’) that sits a few inches above the earth and reveals from every vantage point a lush landscape. Only one interior structure mars the transparency: a brick cylinder that hides a bathroom. The 47-acre estate grew to include eight ancillary buildings, each of them a laboratory for his changing tastes. The 1970s brought his industry’s top accolades. In 1978, Johnson won the Gold Medal of the American Institute of Architects. The following year, he won the first-ever Pritzker Prize, which honored an architect of international stature with $100,000. Commissions continued to pour in: among them, the Minneapolis IDS Center, the Boston Public Library, and the Crystal Cathedral in Garden Grove, California, completed in 1980. Around that time, Cleveland leaders decided Johnson should leave an imprint on his native landscape. 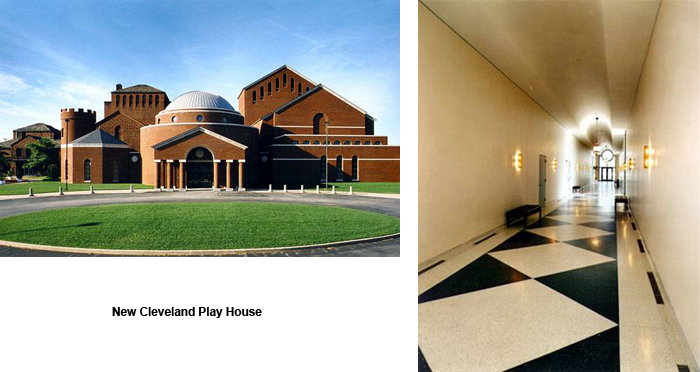 The first commission came from the Cleveland Play House, which was consolidating its operations under one roof on Euclid Avenue at 85th Street. Johnson re-imagined the facility as a Romanesque-style village, with the classically designed Bolton Theatre as a centerpiece. Reviews were mixed about acoustics, sight lines and other practical considerations, but the project remains a nationally recognized example of his mix of classical elements in a Modernist structure. 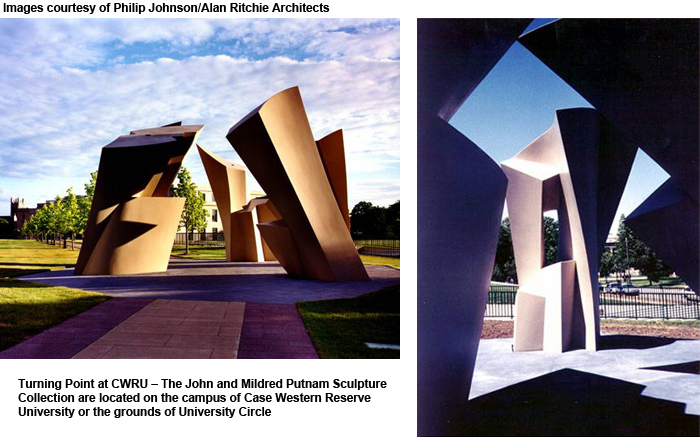 In 2001, Cleveland dedicated his second and final hometown commission: the Turning Point Gardens sculptures on the campus of Case Western Reserve University. At the dedication, he chided university officials for no longer having a school of architecture. It wasn’t the first time he spoke his mind. Nor was it the last. For behind the creative genius was a man of strong convictions. Some of those were misguided, most notably, his youthful embrace of National Socialism in Germany. Johnson would spend the rest of his life atoning for his pre-war affiliations. Cleveland Plain Dealer architecture critic Steven Litt, who visited Johnson in New Canaan in 1997, wrote that Johnson regretted not having left more of an impact on Cleveland, stung by losing design bids for both the Key Bank Tower and Cleveland Public Library’s East Wing. Litt believed that Johnson’s presence was still felt in both projects, even if his name was not on either one.